Foddrill construction recently participated in the Leukemia and Lymphoma Society’s (LLS) Light the Night in honor of Leonora’s late husband, Jimmy Foddrill, who passed away in 2014. Over 5,000 participants joined together at the Auto Club Speedway in Fontana. “It was a commitment on my part to continue to fight for those who are still fighting the battle and to support those caregivers and family members who are still going through the battle, and fight with them.” shares Leonora Foddrill, founder of Foddrill Construction. 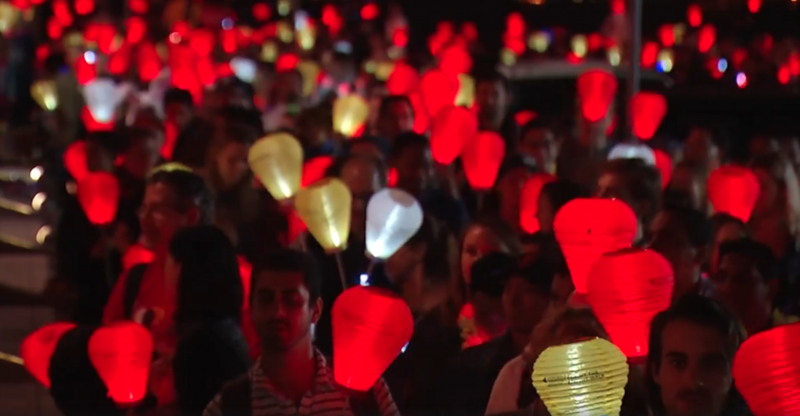 Lanterns during the event are representative of where someone is in their battle with cancer. Red symbolizes supporters, Gold is symbolic to those who have passed and white lanterns represent those who are currently battling or are survivors. Foddrill takes pride in bringing community, staff, and families together to walk in celebration of those who are fighting and to show support for caregivers and their families. Foddrill Construction staff members Light the Night in memory of their family members. Leonora offers her Adam West Batmobile, which was on display during the many festivities of the LLS Walk. While the Light the Night event may have passed, you can still join Foddrill Construction in supporting the Leukemia and Lymphoma Society by donating, click here. Posted in Community, Foddrill Construction, Leonora Foddrill.